It appears as if SUVs have undergone a reformation over the past 20 years – a reformation that’s likely been the cause of their meteoric rise in popularity. Automotive technology has converted what used to be loud, gas-guzzling, raucous-inducing rides into confident, refined, and fuel-efficient people movers. Perhaps that’s exactly what’s drawn more and more folks to SUVS, or perhaps it’s the fact that SUVs often provide drivers with an uncompromised driving experience like their rugged reputations promise. Regardless of what the real cause is, the truth is that SUV sales are expected to make up 40 percent of all new vehicle sales in 2018 – set to average a little over four million units. In the case of Jeep vehicles, it’s safe to say that their lineup and its abilities have not been watered down, especially the Jeep Cherokee Trailhawk Elite 4×4 and the Jeep Wrangler Rubicon. The Jeep Cherokee Trailhawk is one of those best-bang-for-your-buck SUVs with an MSRP of $40,245. 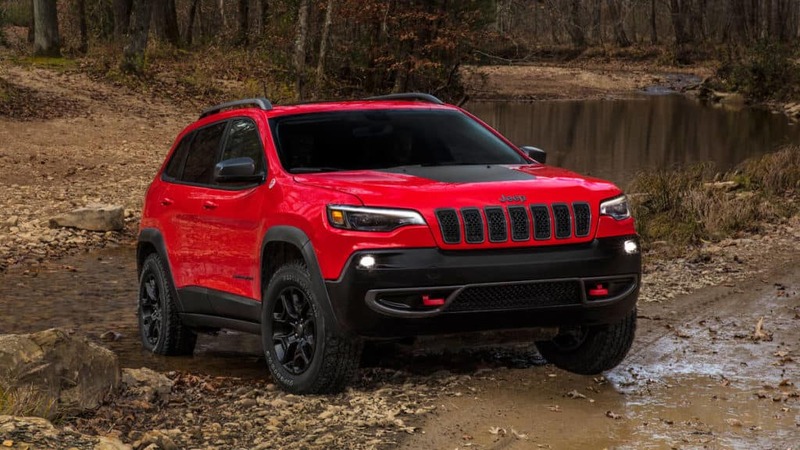 With its unibody construction and “Trail Rated” badge, the Cherokee Trailhawk lives up to its billing as its never out of its element; able to tackle even the most aggressive off-road courses. A 3.2-liter V6 engine rests under the hood, with a leading nine-speed automatic transmission and an Active Drive Lock 4×4 system making this a top-notch off-roader. Also standard on the Cherokee Trailhawk is a crawl control feature, hill descent control, and skid plates. Additional Elite and Technology option packages are also available and offer luxurious perks like heated and ventilated front seats, adaptive cruise control, and parallel and perpendicular parking assistance. “Go Anywhere, Do Anything” is the Jeep brand slogan, and no other vehicle in their lineup embodies this slogan more than the Wrangler Rubicon. Powered by a 3.6-liter Pentastar engine (there’s also a 2.0-liter turbocharged option) and equipped with the Rock-Trac 4×4 system, the latest Rubicon is awesome both on- and off-road. Jeep really elevated the Wrangler from a capable lifestyle vehicle to a full-fledged uncompromised off-roader with their latest redesign. Engineering upgrades on the 2018 Rubicon refine the ride’s driving style on the pavement while locking differentials and an electronically disconnecting front sway bar allows it to quickly transition to off-road conditions. An industry-leading approach angle of 44 degrees, a departure angle of 37 degrees, 10.8 inches of ground clearance, and up to 30 inches of water fording make the Wrangler the benchmark for off-roading and everything in between. The 2018 Wrangler Rubicon has a starting MSRP of $42,445 (plus destination fee). The Jeep Experts here at Hollywood Chrysler Jeep don’t want you to just take our word for it, come in and experience these vehicles for yourself. While we can’t provide you with an off-road course to put these vehicles to the test, we can actually provide you with the latest Jeep Cherokee Trailhawk 4×4 Elite and Jeep Wrangler Rubicon inventory. Schedule your test drive today!